Get the new TOwaste App! Find out what waste items go where, what waste to put out when and where to donate items or find City Drop-off Depots with the new TOwaste App. The Waste Wizard search tool with information on how to properly dispose of over 2,000 items. Collection schedules for daytime curbside customers. The ability to set reminders for your collection day and opt-in for alerts about service changes. Information about where to find donation locations or City Drop-off Depots. The TOwaste App is free to download and available for iOS and Android devices. On May 5th, neighbours from all over Ward 25 joined me at the York Mills Collegiate Institute to donate and recycle their used materials. Ward 25 had one of the most well-attended Community Environment Days in the City of Toronto! Thanks to the incredible engagement from residents at this year's event, there was an overwhelming amount of donations that went to help local schools and community organizations. The Toronto Salvation Army even had to bring in a second collection truck to accommodate all of the great donations they received! Countless electronics, household hazardous waste items and used pens were also brought to my Environment Day for safe disposal, making the City of Toronto more green and clean. In the interest of being green, free compost was in high demand at my event as families geared up for spring gardening. I was pleased to have the opportunity to speak with many friends in the ward, as well as new neighbours, about both achievements and emerging issues in Ward 25. 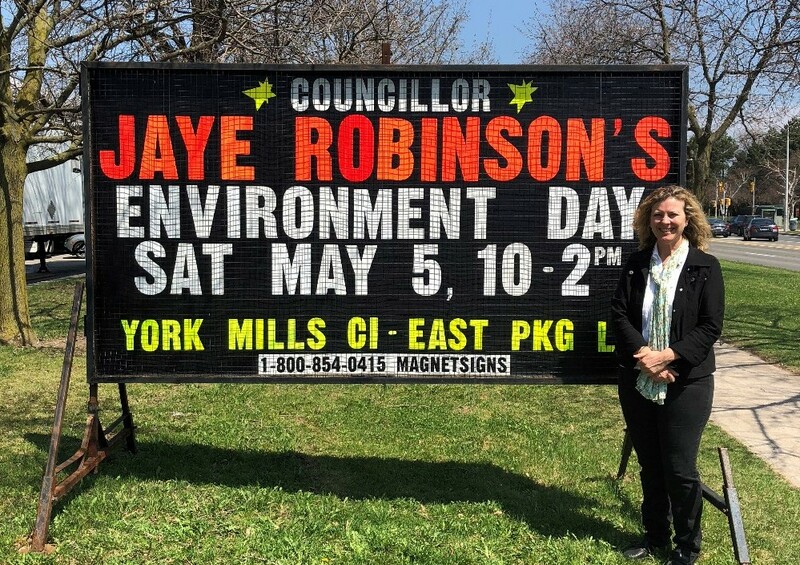 Thank you to all who stopped by my booth to say hello - without your contributions, donations and disposals, my Environment Day would not have been such a great success. I also would like to thank the dedicated volunteers, organizations, and staff who attended. It was great to see so many City divisions involved in my Community Environment Day including Toronto Water, Solid Waste Management Services and 311. Community organizations such as Live Green Toronto, Toronto Hydro and the Salvation Army made major contributions to my Environment Day as well, both in terms of donation collections and providing information to residents about their organizations. This is one my favourite events in Ward 25 and I am already looking forward to next year's Community Environment Day! The City of Toronto is home to the fourth largest municipal waste management system in North America, managing approximately 200,000 tonnes of recyclables annually through its Blue Bin Recycling Program. Last month, Solid Waste Management Services (SWMS) brought forward a report on the State of Toronto's Blue Bin Recycling Program. As Chair of the Public Works and Infrastructure Committee, I was concerned by the challenges emphasized within the report regarding blue bin contamination, recent developments in international markets and the delay in transition towards full extended producer responsibility. Waste Audit results have indicated that contamination in the Blue Bin Recycling Program has been increasing since 2013, at both single family and multi-residential locations. Contaminated recycling is currently costing the City millions annually and last year more than 52,000 tonnes of non-recyclable material was incorrectly put in the Blue Bin. Contamination in the Blue Bin Recycling Program has been increasing over time due to a number of factors. Residents in the City of Toronto are often confused by the City of Toronto's recycling program, as items that are accepted in one municipality's recycling program may not be accepted in another. At the most recent Public Works and Infrastructure Committee meeting, I requested that staff address misleading advertising of products and/or packaging recyclability in Toronto. Many residents feel they are recycling right by following labels on the product, however, these items may not be accepted in Toronto's specific recycling program. This may lead to further contamination that deems a recycling bin as waste. This is confusing and unfair to our residents. I also moved a motion requesting SWMS to report on the ability of the City of Toronto to require retailers of textile material in the City to post reuse, recyclability and waste disposal options at the point of purchase. The average Toronto household throws out about 13 kg/29 lbs of clothing and other textiles every year. Unfortunately, when these textiles are placed in the blue bin, they can tangle sorting machines, damage equipment and cause workplace injuries. Overall, there is a lack of awareness of the negative implications of improper disposal of non-recyclable items and recycling correctly. The state of Toronto's Blue Bin program is concerning and residents must do their part to ensure they are recycling right, preventing contamination and doing their part to reduce the production and use of recyclable materials. When perfectly good recyclables end up in the landfill, it costs the City of Toronto and our residents. Confused which products go where? Visit the City's Waste Wizard to search over 2,000 different waste products and determine the appropriate disposal techniques. As one of the largest and most successful municipal recycling programs in North America, the City of Toronto's Solid Waste Management Services continues to address contamination, react quickly to changing market dynamics, and provide a strong platform on the transition to an extended producer responsibility model. A number of residents have recently reached out to my office to share their concerns about improper disposal of dog waste in Ward 25. In response, I've included a brief review of Solid Waste Management's recommendations for disposing of dog waste properly. DO: Take a baggie with you to pick up dog waste. DO NOT: Throw dog waste baggies into bushes or trees, as plastic bags containing dog waste do not break down. DO: Dispose of dog waste in your personal green bins. DO NOT: Leave dog waste on your neighbour's property or in your neighbour's garbage bins/yard waste bags. Help keep the neighbourhoods of Ward 25 clean and safe for all to enjoy! Join the City of Toronto on March 21, 2018 at City Hall for an update on the City's Waste Strategy! Learn more about what will be considered when determining whether or not to accept new materials into the Blue Bin recycling and Green Bin organics streams and provide feedback that will help inform future policies. The event will also provide a look at what the new provincial Waste Free Ontario Act and current market changes could mean for Toronto. Attend the Open House and learn more about City programs including: 3R's Ambassadors, Waste Reduction Community Grants, and more. RSVP via Eventbrite by March 18, 2018. Help curb contamination in Toronto's Blue Bin recycling program. Contamination in Toronto's Blue Bins has significantly increased in recent years. When Blue Bins are contaminated with too many non-recyclable items, the recyclable materials cannot be sorted adequately – resulting in recyclable items being sent to landfill. Contaminated recycling not only impacts our environment negatively by increasing the strain on our landfills, but it also costs the City millions annually. Just last year, more than 52,000 tonnes of non-recyclable material was incorrectly put in Blue Bins. In order to achieve our goal of a 70% waste diversion rate by 2026, we need to do better. Solid Waste Management Services (SWMS) is using a progressive approach to reduce contamination. Blue Bins are being inspected prior to pick-up, with bins that are contaminated being tagged and left behind on collection day. Notices indicating why the bin was not collected are left with the contaminated garbage, requesting residents to remove the contamination before the next recycling collection day. While it is still early in the program, the City has seen positive results in the reduction of contamination following the implementation of Blue Bin inspections. Food and organic waste such as food scraps and containers with leftover food have been top Blue Bin contamination offenders. Old clothing and textiles also do not belong in the Blue Bin. Instead, donate or bring items to my Environment Day this summer! Another common mistake is recycling hot beverage cups in the blue bin, these are lined with plastic or wax that cannot be recycled. However, non-black plastic lids and paper sleeves should be placed in the Blue Bin. You can help improve the City's waste diversion by learning which bins your waste goes into. Ask the Waste Wizard to find out where and how to properly dispose of any specific item. The City of Toronto's Solid Waste Management Services 2018 calendar is packed with information and tips on how to reduce, reuse and dispose of your waste properly, and includes a "Put Waste in its Place" Poster to help you figure out what goes in the Blue Bin, Green Bin, Garbage Bin and more! Have an innovative idea to reduce waste in your community?